We welcome people of all ages to our dances, including children. $10 for non-members, $7 for members, and $5 for students with ID, with maximum of $25 for a family. DANCE HOTLINE PHONE NUMBER: 972-546-8858. New Officers for 2019: Barb Smith (President), Martha Quigley (Vice President), Janis Adams (Secretary), Jim Sproul (continuing as Treasurer), Lee Dixon (continuing as Membership), Glenn Manuel (Newsletter, Historian). STARING IN JANUARY 2019, THE 2ND SATURDAY CONTRA DANCES ARE MOVING FROM IRVING TO THE LUTHERAN CHURCH! Sat Mar 2, 7:30 - 10:30 pm: Contra Dance at the Lutheran Church in Dallas. 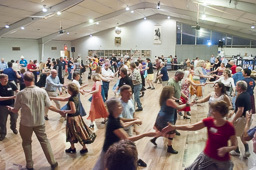 Sat Mar 9, 7:30 - 10:30 pm: Contra Dance at the Lutheran Church in Dallas, with open caller and open band. 2ND SATURDAY DANCES ARE NOW AT THE LUTHERAN CHURCH, NOT IN IRVING! Download a list of tunes for the open band. Sat Mar 16 7:30 - 10:30 pm: Contra Dance at the Lutheran Church in Dallas. Sat Mar 23, 7:30 - 10:30 pm: English Country Dance at the Lutheran Church in Dallas. A big THANK YOU to all who participated in North Texas Giving Day 2018. 2,690 North Texas nonprofits received 157,184 donations totaling over $48 million! NTTDS received $1,959.70 from 14 donors (before any bonuses and fees ). We certainly appreciate your support. Sign up for our email newsletter here. Join or Renew your Membership here. In appreciation of the generosity of the First United Lutheran Church in allowing NTTDS to host our dances in their hall for several years, we extend an invitation to all its members to attend one of our weekly dances free of charge. English Country Dance in Fort Worth, 7:00 pm, at 4601 Frazier Ave. The schedule varies. See their Southwestern Folks - Dancing Facebook page. For more Non-NTTDS events, see the Schedule page. Join our Meetup group and/or our Facebook web page. Want a quick idea of what Contra Dancing is like ? Here is a YouTube video of one of our dances. 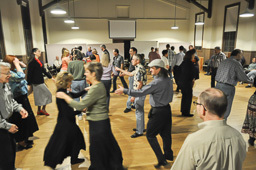 Listen to and/or read the transcript of a recent article about Contra Dancing on Public Radio. Buy merchandise with the NTTDS, Fiddler's Dream, and WIDS logos from our Cafe Press Store! for Producer, Drinks,and Sound. We'll train you! Here is the description of volunteer duties. To help out, sign up at our Sign Up Genius web site. The North Texas Traditional Dance Society (NTTDS) was chartered in 1986 as a non-profit educational organization to promote a better understanding and appreciation of American folk dancing, its music, its history, and related folklore. It is an group affiliate of the Country Dance and Song Society. We are an all-volunteer organization, based in Dallas, TX. The main kind of dance we do is called Contra Dancing. It is a form of American folk dance derived from English Country Dancing. It has no fancy footwork, so is easy (and fun) enough for beginners to enjoy almost immediately, especially with occasional help from our friendly experienced dancers. By far our most popular activities are the Community Dances we hold almost every week: English Country dances on 4th Saturdays, and Contra dances on most other Saturdays. These are open to the public and feature live music in a smoke- and alcohol-free environment. No experience is needed, because all the dances are taught. You don't need to bring a partner. We encourage everyone to change partners for each dance. Every spring we hold a weekend dance festival, featuring a nationally-known band and caller. This draws over 100 people from Texas, Oklahoma, and a several other states. To sign up for our Email Newsletter, use this page. To join or renew your membership, use the Online Membership page. Membership forms are also available at all our dances.